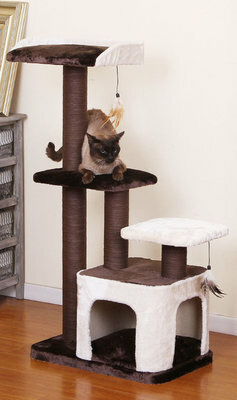 Stylish cat tree adds a splash of color, with an elegant feel to any home! Includes (3) perches, paper rope scratching posts, teasing toys and a condo for your cat to rest. Perches are plush covered cushion with a weighted bottom to help prevent tipping. Super easy to clean! Lint roller or vacuum, with spot cleaning. Assembly needed! Approximately 15 minutes and all tools included. Dimensions: 23" x 15" x 45"